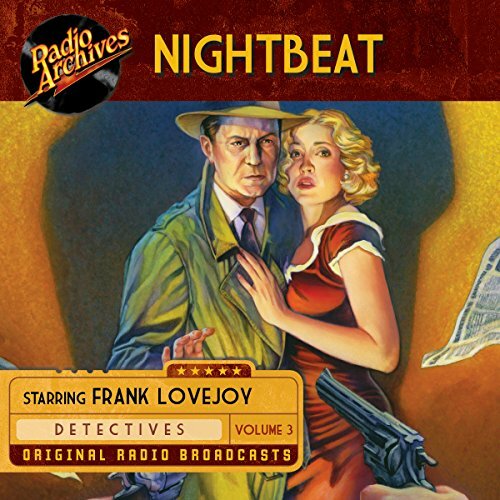 In this first volume of Nightbeat, Frank Lovejoy stars as hard-nosed Chicago Star newsman Randy Stone, a reporter who looks for the human stories behind the headlines. Lovejoy's distinctive voice and manner, combined with excellent scripts and performances by radio veterans like Lurene Tuttle, Peter Leeds, and Jeff Corey, give the series an unusual and engrossing style - literally film noir for the mind. One week the story is lighthearted and tongue-in-cheek, the next it is tragic, with a downbeat ending. There are suspenseful races and quiet reflections on everyday life among the masses. Through it all, Stone, in a sensitive portrayal by Frank Lovejoy, narrates the story and comments on it from beginning to end, often with a hard-edged cynicism that covers his personal sense of fairness and morality. In this second volume of Nightbeat, Frank Lovejoy stars as hard-nosed Chicago Star newsman Randy Stone, a reporter who looks for the human stories behind the headlines. Lovejoy's distinctive voice and manner, combined with excellent scripts and performances by radio veterans like Lurene Tuttle, Peter Leeds, and Jeff Corey, give the series an unusual and engrossing style - literally film noir for the mind. In this third volume of Nightbeat, Frank Lovejoy stars as hard-nosed Chicago Star newsman Randy Stone, a reporter who looks for the human stories behind the headlines. Lovejoy's distinctive voice and manner, combined with excellent scripts and performances by radio veterans like Lurene Tuttle, Peter Leeds, and Jeff Corey, give the series an unusual and engrossing style - literally film noir for the mind.